What’s not to love about romance and royalty? A sizzling spin-off just as addictive as America and Maxon’s story. 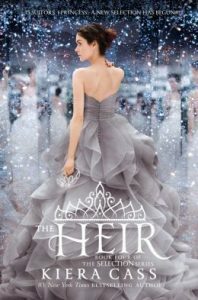 The Heir is a wonderfully enjoyable and addictive follow up to the core three books in the Selection series. Just as before, I found myself readily devouring the pages fast, engrossed by the tribulations of this reluctant princess. It was great to see Maxon and America again, see how they interacted with each other and their children. Although The Heir definitely has the same feel we’ve all come to love, Princess Eadlyn is quite a different character than her reluctantly royal mom had been at her age. Princess Eadlyn’s life had centered on her preparation to rule. She helped her father, attended meetings, toiled through budgets, surmised what should be done as issues began to arise in a now caste-free Illéa. She would be the first female to be crowned. To that end, she sought respect, focused on the work, and in some way closed herself off to grand love stories and softer, girlish endeavors. But when those issues in the kingdom escalate, a Selection becomes the perfect distraction for the citizens of Illéa, bringing excitement and peace (albeit temporarily) to the unrest. Eadlyn fiercely protested. The last thing she needed, wanted, was to be married. To be paraded around as a prize to be won. But this would be her first tough lesson as ruler, her life was sometimes not entirely her own. In addition, King Maxon seemed weary and consumed by the weight of the conflicts in the kingdom. She had to do this for her Dad… but in a way that would be to her own benefit. Princess Eadlyn thought she had a way to cheat the Selection, but before too long, she finds herself at the center of many a predicament. Problems worsen, feelings get hurt, nameless participants become human and emotions ignite with whom she least expects. Among Eadlyn’s most worrisome issues is that she isn’t perceived as relatable. Is she truly in touch with the people of Illéa? Did she realize how her demeanor had hurt others, hurt her chances of being as loved by others as her father and mother had been loved by the kingdom? She’s perceived as callous, out of touch, stubborn, spoiled. Was she? This story primarily centers on Eadlyn’s internal struggles. Her self awareness. She must realize that vulnerability doesn’t detract from power and that allowing yourself to love, and be loved, doesn’t mean you aren’t respected and strong. By the end, the story culminates in a way that packs all the feels. I didn’t realize there was another story to come… but there is a fifth book in the series that will continue her story. I can’t wait to see what happens. The love story is there… growing… but I didn’t feel like it was the primary focus. We had moments where we saw Eadlyn be vulnerable, where we saw her let go and yield to her emotions and I LOVED IT. I LOVE where the romance is going, love the guy that I hope she’ll fall for and end up with in the end. Overall, Kiera Cass does a great job of delivering a story that is just as addictive as the rest of the series and I anxiously await more. Click on each image to purchase. Please note the first three books make up America and Maxon’s story. The Heir is a spin-off about America’s daughter, Eadlyn. Then there will be a fifth book that continues that story. In addition, Happily Ever After is a companion novel comprised of short stories (including The Guard, The Prince, The Queen and The Favorite) plus bonus content. I am so excited to read this. I love, love, loved the Selection books and was ecstatic when I heard we were getting more. Great review!